The Federal Bureau of Investigation has dispatched 100 agents to the St. Louis, Missouri area ahead of an expected grand jury decision over whether to bring charges against Darren Wilson, the Ferguson, Missouri police officer who killed unarmed teenager Michael Brown in August. The move underscores the extent to which the Obama administration is taking a leading role in the police crackdown in Ferguson, coordinating behind the scenes with state and local officials. On Friday evening, CBS News reported that two men had been arrested by FBI agents in a sting operation for allegedly “buying explosives to be used during protests.” The two men are allegedly members of the New Black Panther Party. These arrests and the dispatch of FBI agents to the area have the aim of intimidating and terrorizing the population into accepting the decision of the grand jury, which is broadly expected not to bring charges against Wilson. An intelligence bulletin from the FBI to local police departments earlier this week warned that “extremists” are planning to carry out “attacks” against “critical infrastructure” in connection with the grand jury decision. ABC News has reported, based on undisclosed sources, that the FBI has set up a temporary field office to coordinate its activities. “This is a country that allows everybody to express their views,” Obama said, “Allows them to peacefully assemble, to protest actions that they think are unjust. But using any event as an excuse for violence is contrary to rule of law and contrary to who we are,” Obama told reporter George Stephanopoulos. These remarks parrot the standard line used by the political establishment to justify the police crackdown against demonstrators: While “peaceful” protests are acceptable, these protests are being co-opted by “violent” and “extremist” elements, sometimes denounced as “outside agitators,” who are intent on using the demonstrations as an excuse to break the law. This creates the fraudulent justification for the state to respond to peaceful demonstrations with massive police repression, on the grounds that “violent” and “extremist” elements forced them into taking such actions. In reality, it is the government, not demonstrators, that is the instigator of violence. In August, police responded to peaceful protests against police violence with tear gas, rubber bullets and mass arrests of protestors and journalists. Similar plans are in the works for responding to the grand jury announcement, which is expected within days. Hundreds of National Guard personnel are already being deployed to the region following the declaration of a state of emergency by Governor Jay Nixon on Monday, and area police are switching to twelve-hour shifts beginning this weekend. 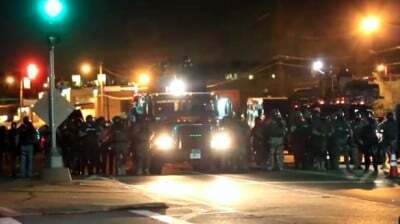 Police carried out arrests against protestors for the second night in a row Thursday evening, chasing demonstrators into a parking lot considered to be a “safe zone” and detaining individual protestors. Also on Friday, Attorney General Eric Holder announced he was issuing new guidelines for police, outlining rules on “How to Maintain Order During First Amendment-Protected Events.” The basic theme of Holder’s remarks was that there exist two types of political opposition, one legitimate and another illegitimate. Even the title of the announcement expresses the conception that some events are “First Amendment-protected” while others are not. But what about concerns that are not aimed at overcoming “community distrust,” or do not advocate trivial changes in police practices, but rather contradict the fundamental interests of the state? What about the demand that killer cops be prosecuted, or that the government stop spying on the people, prosecute officials responsible for torture, and end the bloody and disastrous wars into which the US population has been dragged? These, by implication, are not “meaningful and responsible.” They are therefore invalid and not under the purview of “First Amendment-protected” demands. Anyone making such demands, it is implied, falls under the FBI’s definition of a “violent extremist” and forfeits the rights enumerated in the US Constitution. Holder, echoing Obama, also called on protesters to “adhere to non-aggression and non-violence.” It is worth noting that the US military-intelligence apparatus is the greatest purveyor of violence all over the world. Holder himself will go down in history as the attorney general who spelled out the doctrine that the US government has the right to assassinate American citizens, both abroad and within the borders of the United States, without due process.